Many of the world’s population have no access to appropriate diagnostic, neurorehabilitative or support services following brain injury. Addressing Brain Injury in Under-Resourced Settings: A Practical Guide to Community-Centred Approaches tackles this unacceptable gap in service provision by empowering the reader to provide basic care, education and support for patients with brain injuries and their families. Written for an audience which does not necessarily have any prior knowledge of the brain, neurorehabilitation or brain injuries/pathologies, this practical guide first examines the global context of brain injury, considering the cross-cultural realities across communities worldwide. 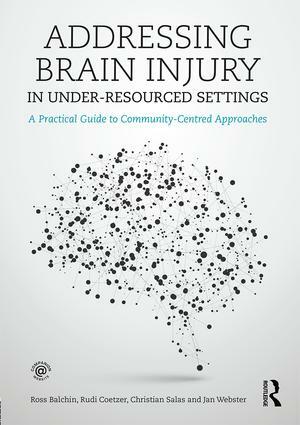 The book goes on to explore the reality of brain injury and how to work with its consequences, offering practical knowledge and advice in a user-friendly, richly illustrated format. It provides easily digestible information about the brain, including its normal functioning and the ways in which it can be damaged through injury and disease. The book also covers the basic skills needed to identify neurological difficulties and provides guidance on basic rehabilitation input and support. The final section of the book covers how to provide services, including working with organisations and communities, volunteering, initiating and developing community-based projects and programmes, and caring for patients and their families from emergency to recovery to rehabilitation. This book is an invaluable resource for community health workers, voluntary sector workers and all professional healthcare providers who work with brain-injured patients around the world. It will also be important reading for policy developers, fundraising organisations and those who work with global humanitarian initiatives. Ross Balchin is a Clinical Neuropsychologist based at Groote Schuur Hospital in Cape Town, South Africa, and an Honorary Research Associate in the Division of Neurosurgery at the University of Cape Town. Dr Balchin also works with the Neuropsychoanalysis Foundation in New York as an independent contractor. He has formerly held both the National Research Foundation NPPD and the Claude Leon Foundation postdoctoral fellowships. Rudi Coetzer is a Consultant Neuropsychologist, and Head of the North Wales Brain Injury Service, Betsi Cadwaladr University Health Board NHS Wales. He is an Honorary Senior Lecturer in Clinical Neuropsychology in the School of Psychology, Bangor University. Dr Coetzer is on the British Psychological Society Division of Neuropsychology Specialist Register. Christian Salas is a Clinical Neuropsychologist and a Psychoanalytic Psychotherapist. He is a researcher at the Cognitive and Social Neuroscience Laboratory (Universidad Diego Portales) and Training Teacher at the Dynamic Psychotherapy Unit (J.H. Barak Psychiatric Institute), both in Santiago, Chile. Jan Webster is an independent organization development consultant in the international charity sector. She founded The ComaCARE Trust in 2005 at Groote Schuur Hospital in Cape Town and served as its director for ten years, during which time she started its HeadsUP! community brain injury rehabilitation programme. She has successfully promoted public brain awareness through cofounding an official World Design Capital 2014 project entitled Brainstorm the City. In 2007, Jan became an Ashoka Fellow in recognition of her social entrepreneurship.